Today’s episode of The Peoples Post explored the issue of modernising the Post Office, looking particularly at the development of postcodes. In order for the introduction of postcodes to succeed the public needed to be willing to adopt them. Psychological studies showed that the best means of achieving this was for the postcodes to “compromise familiarity and brevity”. Once a system of postcodes encompassing both these virtues was developed and rolled out, the next step was for the Post Office to publicise the new means of addressing the mail. 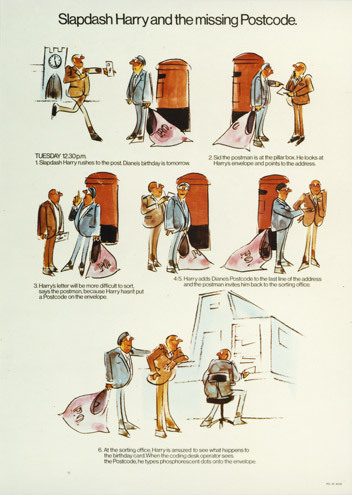 The Post Office invested heavily in a range of campaigns to increase the use of postcodes. In the late 1970s these campaigns were intended to “remind, not persuade people to use their postcodes”. This recognised that the main reason for not using a postcode was forgetfulness, rather than outright resistance to postcodes. 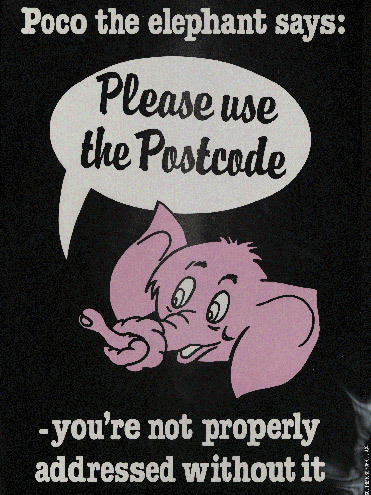 One character helping promote postcodes in the 1980s was Poco the elephant. Although the use of an elephant in publicity campaigns played on people’s forgetfulness when using postcodes, Poco himself is well remembered by visitors to the Royal Mail Archive. In addition to this poster, we also have a range of other material produced as part of this campaign, including a pen, a sweatshirt, a badge, and a vinyl record (the Postcode Song, with Poco on the cover). 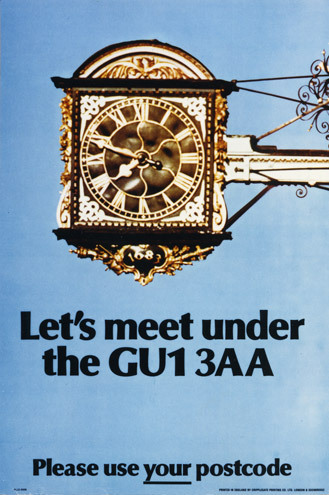 Other campaigns, such as the one below from the 1970s, attempted to use storytelling as a means of increasing the use of postcodes. This style of poster gave more scope to explain why postcodes were important. The storytelling element also helped members of the public relate to familiar situations. Finally this poster from the 1980s uses the notion of a romantic rendezvous to drive the postcode message home. This romance echoes attempts in the 1930s to promote the use of London postal districts, as beautifully portrayed in the film N or NW. For more on today’s episode of The Peoples Post see our webpage The Post Code. Further images can be found on Flickr. Use the Twitter hashtag #PeoplesPost to comment on the show. POST 17/173, Code Design and the Design of Keyboards: Report of work carried out on behalf of the Post Office, 1958-62. MD/FE/1342 Postcode system – design of postcodes and the extent to which consumer reaction was tested. Including “social survey on post office services” 1956. This entry was posted in Archive, Peoples Post, Postal History and tagged advertising, campaign, GPO, N or NW, Poco the elephant, Post Office, postcode, postcodes, posters, promotion, publicity, Royal Mail, The Peoples Post. Bookmark the permalink.